Was on vacation last week but this week I’m back at it. 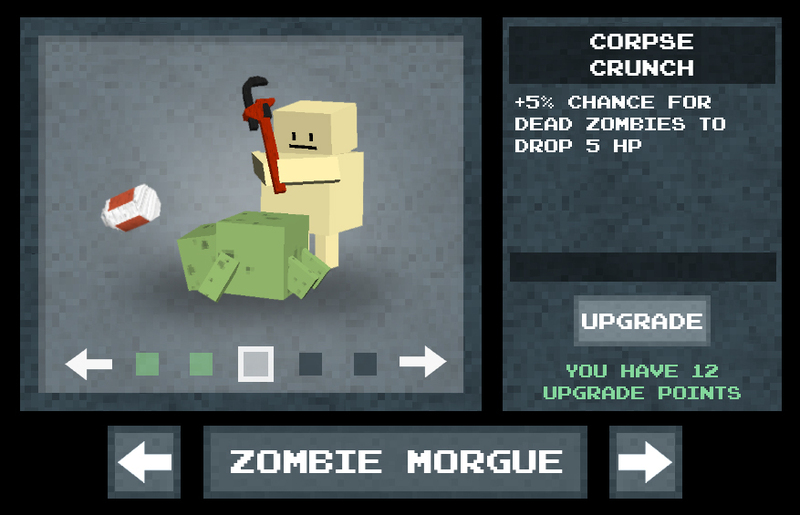 Worked on the layout for the upgrade screen and finished off the 50 upgrade animations. Once these are implemented into the game, it’s just a matter of coding in the actual upgrade abilities and then I’m done with all the character customization systems. Here’s how the layout is looking. I’ll demonstrate what all the different buttons and things do in the next update! 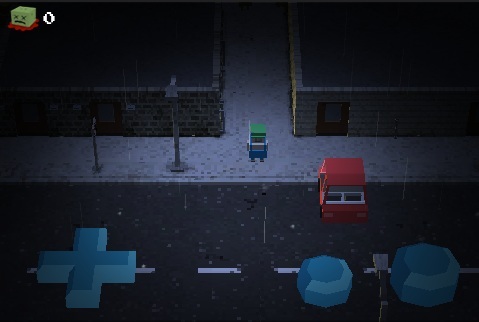 This week I worked on some animations for the leveling system. Zombox will feature 50 possible character upgrades that can be earned as you gain XP. The upgrades themselves will include weapon/attack enhancements, fitness/stamina boosts, health bonuses, special crafting recipes, etc. Each upgrade in the menu will be accompanied by an animation showing what it does (or what it applies to)…so those are what I’ve been working on this week. The tricky part is not only that there are 50 of them that need to be made, but also that most of them need to loop seamlessly. You can now find dozens of books around the city of Zombox. You can read books by dragging them onto your character in the inventory window. 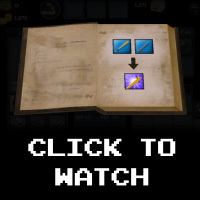 When read, a book will reveal a crafting recipe to the player. When you craft something, or when you read a book’s crafting recipe, the recipe will be added to the new quick-craft panel. The quick craft panel can be opened by pressing an empty slot in the crafting window. In the quick-craft panel, you’ll see all of the recipes that you’ve learned, and if you have the ingredients for a specific recipe in your inventory, its icon in the quick-craft panel will be enabled. If you click an enabled icon, the corresponding recipe ingredients will be added to the crafting panel. This makes it easy and fast to craft things. Some items and weapons can now be ‘upgraded’ in NPC stores. If you find something damaged or broken, you can upgrade it to repair it. You can also upgrade some items past their default condition to special conditions like ‘new’, ‘shiny’, ‘special’ and ‘super’. 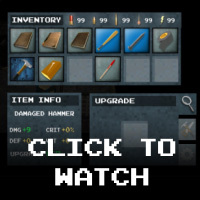 These upgrades will greatly increase things like damage and/or critical hit values. You can now build storage chests to store your items in. Click the images below to see animated examples of the above! 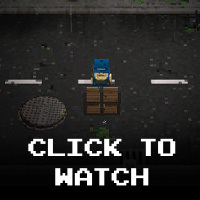 it now has an XP system, that allows the player to upgrade his/her character. 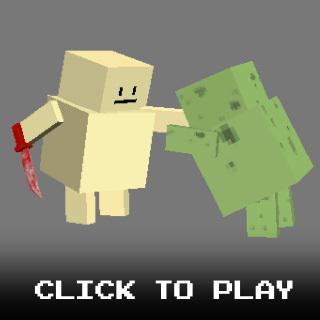 XP is earned by killing zombies. it now has various healing items that can be collected. Pills, medkits, syringes, bandaids, etc. the inventory GUI has been updated to display ammo counters for the five types of collectible ammo in the game. Lots of Zombox progress this week. Here’s a video showing it. 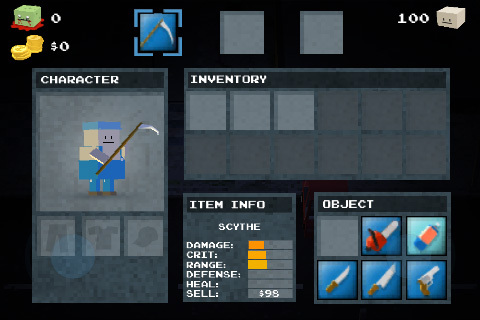 Implemented the inventory windows into the game. Got icon dragging, active slots, etc and everything working. 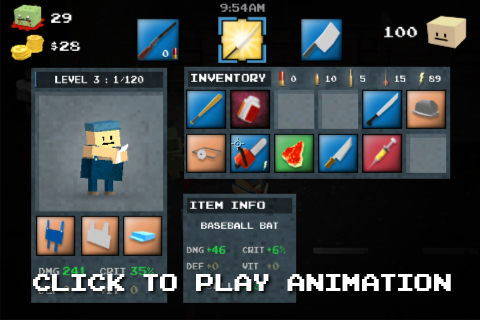 Note: in the video the weapons that the character uses are being dragged into the inventory from the “object” panel. The “object” panel right now is temporary, but in the final game this will be where objects and items from characters and places you search around town will show up. 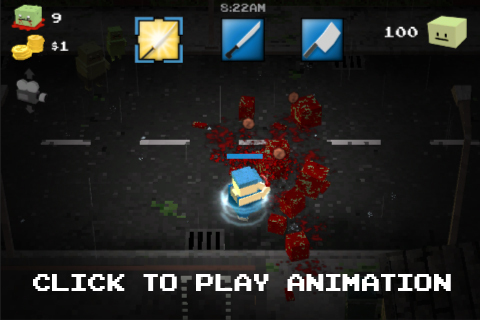 Implemented the weapon system (animation, scripting, etc). The character’s animation/pose now adapts to the weapon type and each weapon and item has unique properties. The on screen controls were redesigned after much deliberation, after getting feedback from many people that the old controls were too bulky. 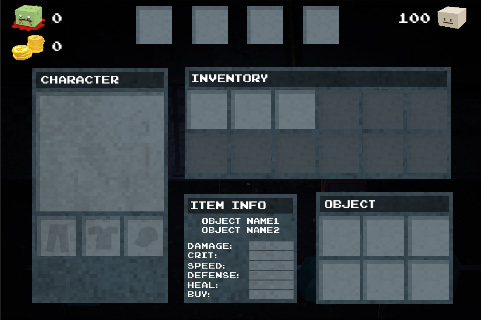 Been working on the inventory system for Zombox. Here’s how the raw inventory window looks. 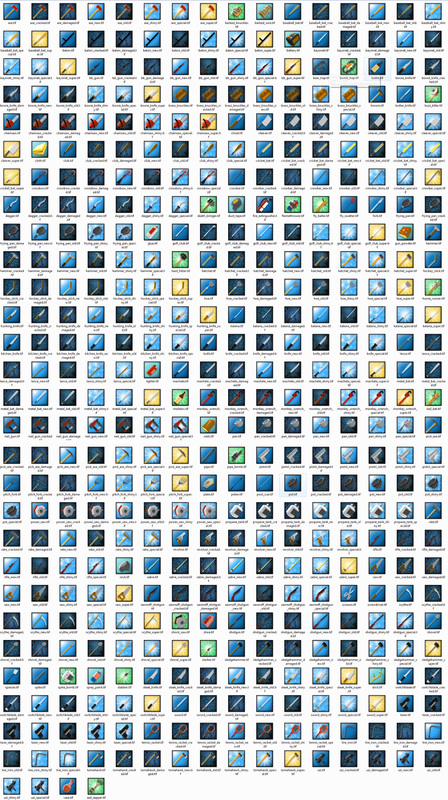 Here are the inventory icons for all the weapons and some of the items in Zombox. 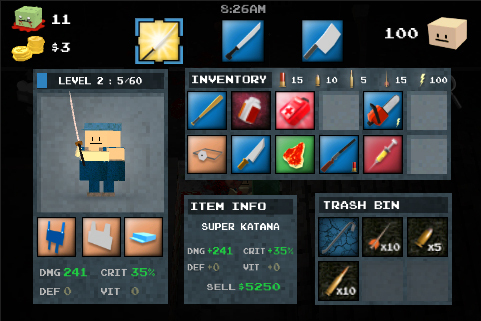 The inventory window will have expandable sockets based on the player’s XP level, and that space to the left will show how the player looks with whatever items are equipped. I got some feedback about the size of the UI controls in Zombox, so I went with a sleeker redesign. Some people suggested I make them semi-transparent but unfortunately transparent shaders cause the iPhone to chug so I’m keeping them opaque. It’s worthy to note that the web version of Zombox will not have these visible controls at all, since keyboard shortcuts will control the character, rather than clicks on a screen.